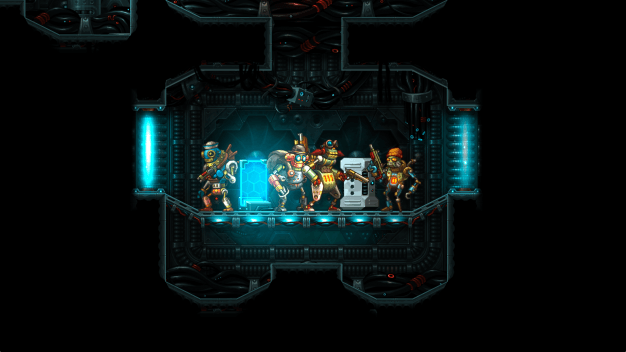 SteamWorld Heist is the successor to 2013’s Metroidvanian influenced SteamWorld Dig. 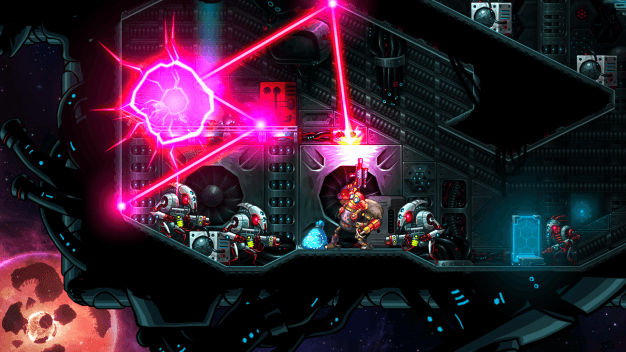 While the art direction and characters are clearly connected to developer Image and Form Games’ original robot populated world, SteamWorld Heist features a completely different story and gameplay mechanics, as your rag-tag team of cowboy robots traverse space and engage in turn-based shootouts with various evil foes. The story of the game is not overly complex or compelling, and the game starts off rather slow. You are mostly just directed from one screen to the next as you try to put a team together for the first couple of hours; the story’s most important elements are delivered through in-game videos that are slightly overdone. However, the characters you add to your team all have a distinct personality, and the dialogue is amusing and keeps you going during the slow start of the game. Not to mention their various skills and strengths become essential to your strategy, and therefore overall experience of the game. It felt like a quirky mashup of Firefly, Dungeons and Dragons, and Mega Man – which is certainly a win in my book! In fact, I enjoyed the robot personalities so much that I found myself really wishing there had been voice actors. Each robot is “voiced” by robot-sounding garble, but no actual words are used, so personality flairs are mostly left out. It’s a shame that much of the wit in the writing will probably get lost as the player reads the sentences rather than hearing them. 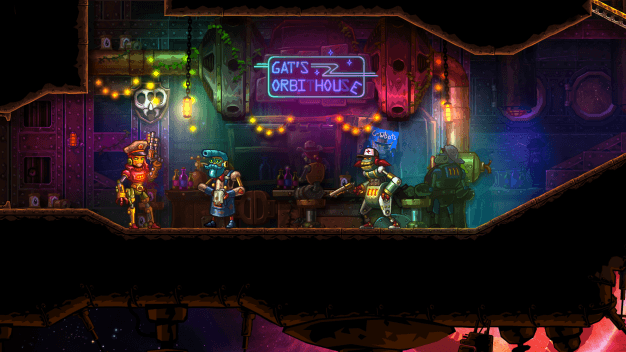 What originally drew me to SteamWorld Heist was the graphics. Having never played the original, I didn’t know what to expect, but seeing the brightly-colored 2D scroller immediately intrigued me. I am just a sucker for beautiful or interesting visuals. I was not disappointed – the graphics truly are beautiful. But, what really won me over was the battle mechanics. Right away, the player is thrown into a tutorial battle, and it becomes clear that the developers worked hard to make this more than a walk, point, and shoot type of game. Your main character, Captain Faraday, uses a gun with a laser sight and can use it to make accurate trick shots. Hitting enemies behind barrels and building up the complexity of these shots can become very addicting and oddly satisfying. Other characters have different weapons and skills, and it is up to you to create the best team for the given mission and to use them strategically to succeed. You will not be simply walking down hallways and shooting things if you plan to make any progress in the game. Of course, you’ve then got accessories like health kits, bombs, and armor to flesh out each team as needed. The only “pointless” item would be the hats – which these bots are pretty obsessed with. I wish that different hats came with different perks to make me care about them at all, but I guess I am just a stick in the mud that way. If I have any gripes about SteamWorld Heist, it’s the penalty for character death. Luckily, characters are not permanently gone when they die. And yet, deaths do subtract stars you need to progress in the game, and the character who died gains no experience – despite what they may have done before dying. This makes it far too easy for characters to fall behind everyone else in level and strength. The only way to really fix it is to take them back to a level you’ve already done (one easy enough that they won’t die) and play it again until they’ve caught up with everyone else. This can get rather tedious very quickly. In the end, I found SteamWorld Heist charming and fun, and spent far too much time perfecting trick shots just for the satisfaction of it. It’s clear the bulk of time and effort in development went to the visuals, graphics, and characters, with the overall story lacking a bit. For the price, it’s a game worth picking up just for the gorgeous graphics, and the procedurally generated levels will give you the ability to enjoy multiple playthroughs. 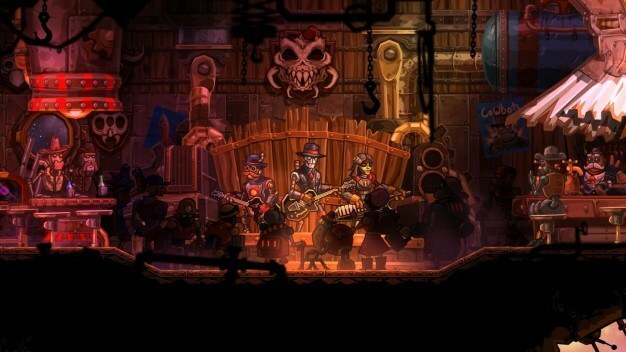 SteamWorld Heist is available now for PS4, PS Vita, Nintendo 3DS, and on Steam. 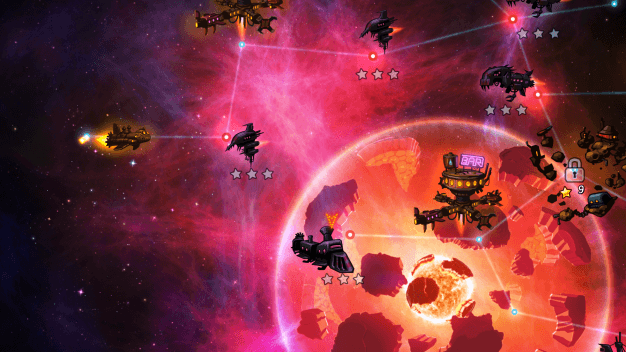 The developers have also announced an upcoming release of the game for Xbox One, Wii U and iOS later this year.